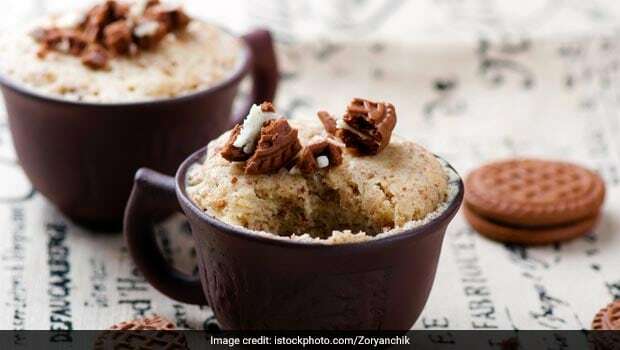 It’s time we thank the person who came up with the idea of mug cakes, the yummy quick treat which has become the go-to resort for sweet cravings. If you are looking for a comforting and delicious dessert, yet lack the patience or expertise to go through the entire baking routine then mug cakes are just what you need. Chocolate cake, brownies, upside down fruit cakes, gooey cakes or cheesecakes, you can have it all in your cosy mug, that too in under two minutes without any hassle. Just dig your spoon in and enjoy! 1. Sift your ingredients: It is always better to start by sifting flour and cocoa powder together to avoid lumps in the batter. 2. Never fill the mug more than halfway: The baking soda or the rising agent in the batter would lift your cake from its original level. Try your best not to drip the batter down the sides of the mug – they overcook in the microwave. The cleaning up that follows later is a task in itself. Save yourself the mess and the effort. 3. Use eggs with caution: Though eggs play a huge role in baking cakes, whether in binding the ingredients or giving it the creamy texture, using them in mug recipes can make the cake dense. If you must use it in your cake, one large egg is enough. Try using other moist ingredients like nut butter, dessert sauces, hazelnut chocolate spread, etc. 4. Cook time: Mug cakes cook fast, so to avoid overcooking, cook in shorts bursts. Start with the shortest time listed in the recipe, and gradually increase the cooking time, if it is still undercooked. It is ideal to microwave the brownie (without peeking) for 1 minute and 30 seconds. Longer spurts of microwaving dries the brownie out. You may have to tweak the timing a little since all microwaves and mugs are of different capacity and nature. 5. Mug desserts can be made without mugs: Surprised? Don’t be. The beauty of these mug treats is that they can be made in mason jars, ramekins and mini glass bowls too. Just put all your ingredients together, and let them work their magic in the microwave. Make a two minute brownie in a mug with this quick recipe by Chandini Mehra. Top it with the ice cream of your choice and enjoy! 1. Take a microwave friendly mug. 2. Add all the dry ingredients in it. 3. Now mix in the wet ingredients. 5. Enjoy your mug cake with ice cream of your choice.